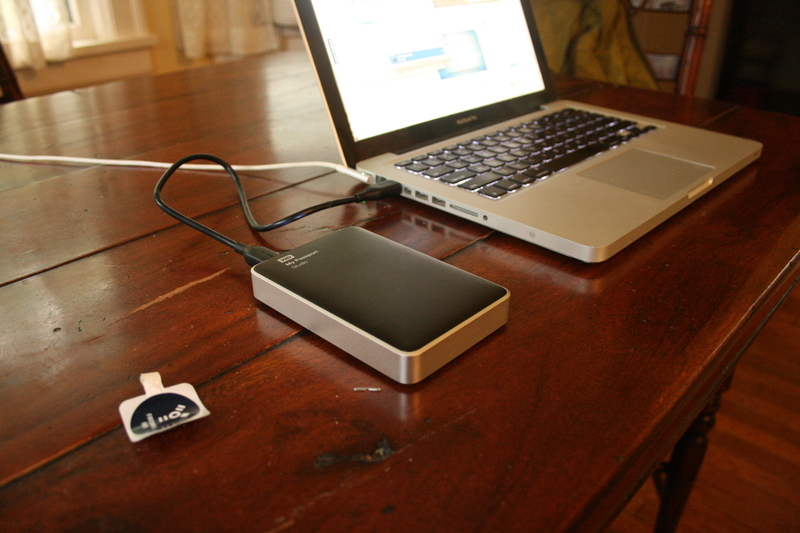 We’ve been messing around with a damn fine looking set of portable hard drives for the past few days from Western Digital called My Passport Studio and My Passport Mac. They are encased in an all-aluminum shell, the My Passport Studio comes with two FireWire 800 ports as well as a Mini USB port around back; the latter only has a Mini USB port. The speed tests on these guys (see results below) was pretty average for 2.5-inch Firewire hard drives at just under 80MB/sec read, making the slight premium Western Digital is asking for these mostly “an aesthetic upgrade”. …not that there is anything wrong with that. You can feel the quality in these drive enclosures. The aluminum shell is going to protect these from more drops than a plastic casing and these drives look the part of a high quality Mac setup. These drives are also so whisper quiet that the only way to know if they are running is the white LED on the back (much better than the front). As you can see from the pictures, both the Studio (formatted Windows) and Mac go well with a Unibody MacBook. IRVINE, Calif. – Sept. 22, 2011 – Western Digital® (NYSE: WDC) today introduced its newest generation of My Passport® portable hard drives specifically designed for use with Mac® computers and Apple® Time Machine®, featuring compact, elegant Mac-inspired designs with high capacity storage options and exceptional security for today’s active lifestyles. My Passport® Studio™ boasts the all-metal design and performance needed for today’s discerning Mac user, serving as an ideal companion for the on-the-go photographer, videographer, graphic artist, or creative professional that produces, shares and consumes massive amounts of digital content daily. 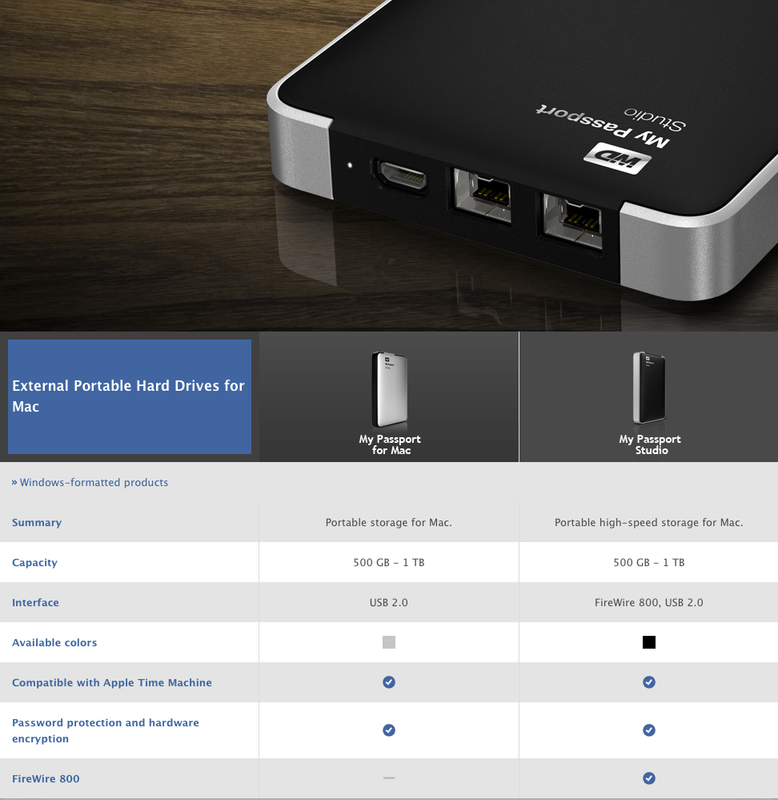 Offering up to 1 TB capacity, the My Passport Studio also provides multiple connectivity options with two FireWire® 800 ports and a USB 2.0 interface. The dual FireWire ports provide blazing fast upload and transfer speeds while also allowing users to daisy chain additional drives or other peripherals such as HD camcorders. My Passport Studio also features encryption and password protection software, and an all-new design constructed of metal for a sturdy feel in your hand and scratch resistance. Housed in a stylish yet durable slim enclosure, the My Passport for Mac® is designed for Mac users who need high capacity storage in an ultra-compact and lightweight design. Available in capacities up to 1TB, My Passport for Mac remains a favorite among students and other Mac users whose work environments may include extensive travel or outdoor and adventure locations. WD’s My Passport Studio and My Passport for Mac are available on the WD store at www.wdstore.com and at select retailers and distributors.